After a very long period of absence from the Oldtimer Grand Prix Hamburg [rumors say that he was last seen there at the beginning of the 90ies! ], and heartily welcomed, Tommy Becker arrived on Thursday but more to spend some time at the different spots of interest like the "Alster", the habour, the famous "Fischmarkt", ... and not to get some extra practice hours. As a member of the "26D-gang" he was accompanied by his "teammates" Johannes Hiltrop and Thomas Sasse [me] on Friday, unluckily Joerg Rehse and Martin Wiese weren't able to come to the "secret capital of the north." On Friday some "displaced persons" arrived already at lunchtime to start practice on the 5-lane "Greyhound" track - World Champion Dieter Jens swiftly came by car [to pick up the family hours later from the train station], just because every single minute counts to find a good set-up. As always racing started on Friday evening with this "fun class". Accepting that the gearbox problems of my Auto Union hillclimb car [which can be found on this site as well] aren't easy to solve the car retired to the show case area for the time being. The new F1 Lotus 56B "Goldleaf" turbine car was assembled with a scratch brass chassis that was build especially with this track in mind. With Uwe "Dr. Evermann" Drevermann's help of manual lap counting on one car that didn't activate the track's timing system, we always got the right lap numbers. Equiped with Martin Wiese's 2002 winning Lotus 56 Johannes Hiltrop was the one looking for victory. But the "Goldleaf" car was nearly as fast and with a softer motor and smooth handling it outperformed the Indy turbine easily and everybody could have won the race with this car. When the last second ticked away Matthias Parke came in on 2nd place [of course his McLaren M7A lost - "same procedure as every year" - all his wings during the race] with 130.52 laps, leaving Johannes' Turbine with 127.15 laps on 3rd but beaten by Thomas Sasse's Lotus 56B "Goldleaf" with 131.15 laps. On the next places were 4th Juergen Stuedemann's BMW F2 with 119.15 laps, 5th Tommy Becker's Lotus 28 with 117.66 laps, 6th Jan Schaffland's Eagle Weslake with 116.32 laps, 7th Alex [Dieter's eldest son] Jens' Ferrari with 115.25 laps and 8th WC Dieter Jens' Ferrari with 114.53 laps. 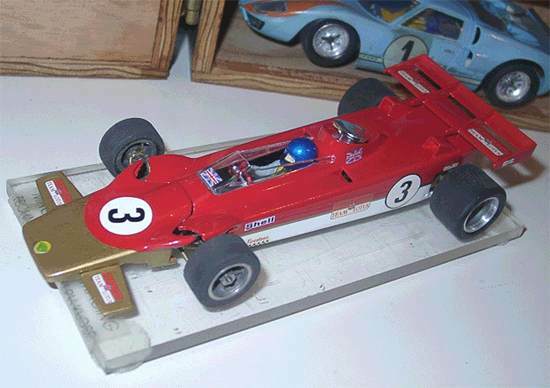 Thomas Sasse's new F1 Lotus 56B Goldleaf turbine car. See more pictures of this great car in Reader's Gallery 70. With Tommy Becker who outperformed the Tamiya-Armada and the Dynamic big guns Joerg Rehse and Martin Wiese at the Oldtimer GP at Mettmann easily with a [spanish!!] Segura McLaren M6B [all original with exception of rims and tires] the "26D-gang" had a real challenger on the racecourse to beat - the homebased "Tamiya-troup". With last year's experience I build another Segura chassied 26D-powered car for myself. But with the 10 Volts [12V used at Mettmann] the 26Ds lose a lot of their bite against the smooth running big Cox Nascar motors. Thomas Sasse's new Segura chassied 26D-powered Porsche 908. See more pictures of this great car in Reader's Gallery 71. The surprise of the first race was Juergen Stuedemann with a blinding fast [much much faster than all the other cars!!] original Cox Chapparal 2E which would have easily won without the car's gearbox and handling problems. Nevertheless, it was great fun seeing the 2E zooming down the straights to flip up the wing under braking! The race ended with my Segura [ouups, sorry Tommy] Porsche 908 in front [134.42 laps], on second Tommy's Segura McLaren M6A [133.08 laps], on third Johannes' Carrera Ferrari 330P4 [131.49 laps] and on fourth place "young gun" Jan's Chaparral 2D [121.09 laps]. The second race was a kind of Tamiya cup with all top drivers using the alu diecast sidewinder frame which has helped to win so much GT-races. 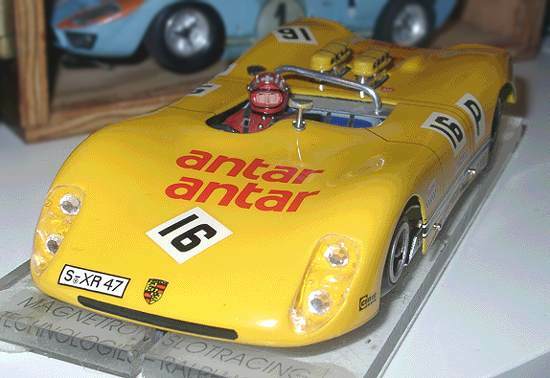 They showed racing at it's best, track marshals will only remember Uwe Steingraeber's 917 [T. Spicker rent-a-slotcar]. When the last smoke has settled Matthias Parke [driving a Ford GT 40 MKIB] came in on 1st place [making the seldom reached hat-trick with wins in 2001, 2002 and 2003] with 145.15 laps, leaving Thomas Spicker's Porsche 917 behind with 141.14 laps on 2nd and beating 3rd Jens Badenkopf's Ford GT 40 MKIB [the Gulf sister car to Matthias'] with 139.58 laps. The Segura cars were found more than 10 laps behind on 4th Thomas Sasse's Porsche 908 with 134.42 laps and 5th Tommy Becker's McLaren M6A with 133.08 laps. 6th was Johannes Hiltrop's Ferrari 330P4 with 131.49 laps, 7th Uwe Steingr�ber's Porsche 917 with 123.50 laps and 8th Jan Schaffland's Chaparral 2D 121.09 laps. Without Martin Wiese's fast Dynamic/Strombecker Cheetah and Joerg Rehse's Dynamic Porsche 917 spyder, it was a neat 1-2-3 victory of the "Tamiya-troup", and a clear defeat for the "26D-gang". Go to Page 2 of this article.